As digital and multi-functional field devices are increasingly used in the process industry today, users have access to large amounts of information available from such devices. Complexity of digital communication protocols and enhanced diagnostics capabilities create the need for tools which provides ease of configuration and analysis of data information. Each digital field device has increased the number of parameters to support multi-variable capability and advanced diagnosis, but improper configuration of these parameters can cause unnecessary alerts from field devices. 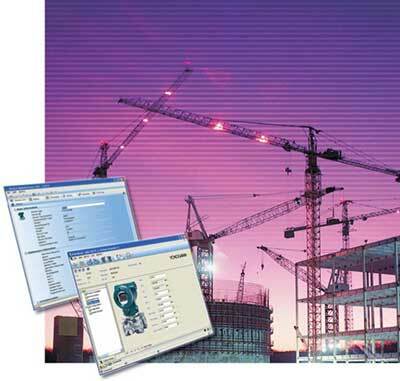 In line with multi-functional and diverse field devices, device configuration software such as an FDT Frame Application and a DTM is required to achieve high-speed performance and multi-functionality for processing more information. The FDT2 standard, released in 2012, helps these software applications deliver faster and better performance while maintaining backward compatibility with the conventional FDT 1.2 standard. This paper introduces FieldMate and device DTM compliance with the FDT 2.0 standard and benefits associated with new standard. After FDT 1.2 was released in 2001, the environment of Windows operating systems which run FDT/DTM drastically changed. Microsoft started to offer the .NET technology which can replace the COM/ActiveX technologies used in FDT 1.x. Today, more industrial tools use .NET while fewer tools rely on COM/ActiveX. Since .NET supports backward compatibility with COM/ActiveX, some DTMs started to use .NET when FDT 1.2.1 was released, and so the basis of the FDT specifications inevitably shifted from COM/ActiveX to .NET. FDT2, which was released in 2012, is fully based on .NET technology. Furthermore, FDT2 includes various functions requested by end users while maintaining the conventional functions of the FDT 1.x specification, such as communication path setup, unified usability, stability, and interoperability. Thanks to .NET technology in FDT2, vendors can develop DTMs with Windows Presentation Foundation (WPF), Microsoft's new technology. WPF enables them to offer DTMs featuring highly sophisticated user interfaces (UI). The FDT2 standard adds real-time monitoring for background processing and batch tasks, and is expected to deliver much faster performance. In addition, it offers stronger security functions and achieves integration with PLCs, thus expanding the applicability of FDT/DTM. With FDT2, the FDT Group also offers common components and tools for developing FDT2-compliant products. FDT 1.x provided their specifications only, and thus each vendor had to implement such components and tools. For FDT2, the FDT Group developed the main part of the UI as common components, which reduced the burden on vendors for testing complex compatibility and interoperability, and so they can quickly release secure DTMs. 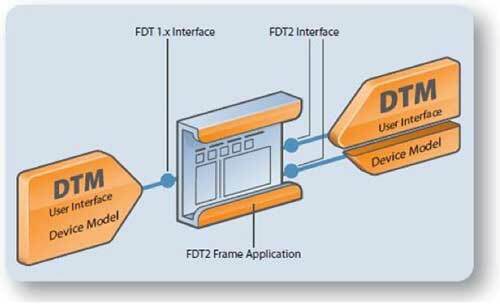 Using FDT2-compliant DTMs requires the FDT2-compliant Frame Application (FDT2 Frame Application). This application also supports FDT 1.x-compliant DTMs. Although the internal structure of FDT2-compliant DTMs differs from that of FDT 1.x-compliant DTMs because of enhanced functionality, the usability is almost the same. As a result, users can use new FDT2-compliant DTMs without any special training. Figure 3 shows the configuration screen of Yokogawa's FDT2-compliant device DTM for DPharp EJX series pressure transmitters (HART communication type). The screen comprises a Navigation area, Identification area, Application area, Status bar, and Action area. Because they are defined in the DTM Style Guide, any manufacturer offers a similar look & feel design, which enables users to operate easily any devices from different vendors. 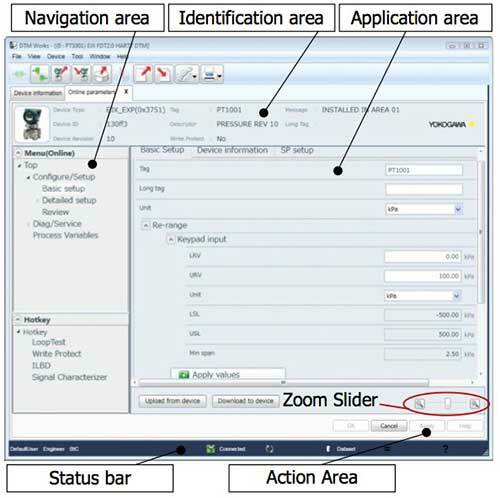 Yokogawa provides Zoom Slider on the bottom right for changing the screen size. This helps users check information on tablet PCs and other small devices. 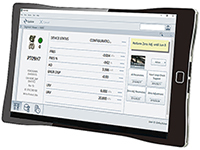 This new graphical user interface provides ease in configuration of simple or complex digital devices to access multi-variables and diagnostics capabilities. This article introduced the FDT2 standard for exploiting digital field devices which is incorporated in Yokogawa's FieldMate R2.06. This Frame Application has improved operability and offers additional diagnostic functions. As digital field devices become more diverse and offer greater functionality, Yokogawa will continue developing and offering FDT Frame Applications and device DTMs featuring very easy and convenient functions. Yokogawa will propose various solutions using field digital technologies and develop user-oriented tools for configuring field devices. For more information on FDT Technology visit www.fdtgroup.org. For more information on Yokogawa FieldMate, please visit our website. FieldMate and EJX are registered trademarks of Yokogawa Electric Corporation. FOUNDATION Fieldbus, HART, and PROFIBUS are registered trademarks of the Fieldbus Foundation, HART Communication Foundation, and PROFIBUS User Organization, respectively.